Welcome to Friday. What a lovely feeling. The weekend to relax and enjoy some stamps and lots more I hope. I got my Hong Kong Post standing order yesterday and it included this. I forgot I had this in the order. 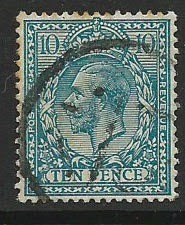 Really stunning and the image really doesn't show the real beauty of the stamps. They are embossed. Click image to enlarge. 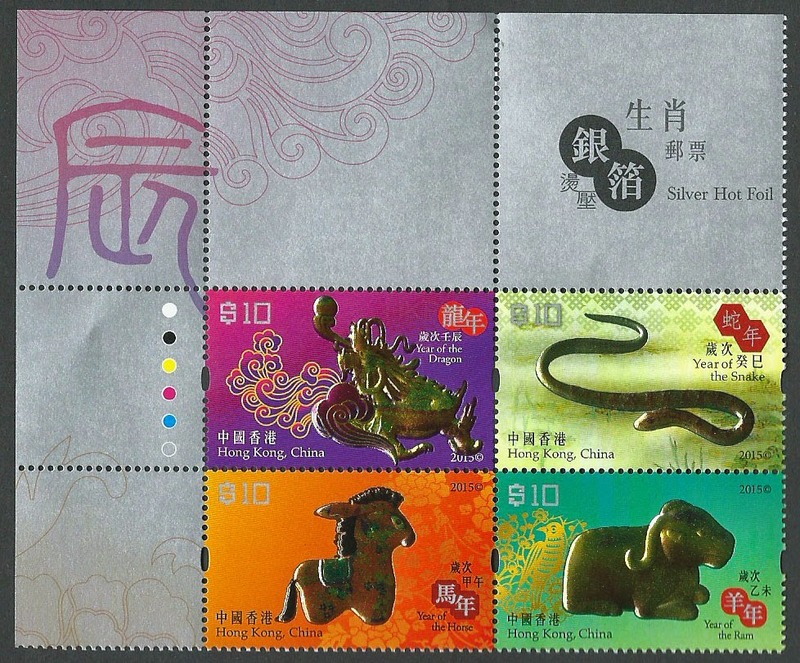 Silver Hot Foil Lunar New Year Animal Stamps – Dragon/Snake/Horse/Ram"
From the Hong Kong Post website : As the first Lunar New Year stamp issue in a new series released by Hongkong Post, the Silver Hot Foil Lunar New Year Animal Stamps – Dragon / Snake / Horse / Ram consist of four stamps, each featuring the Dragon, Snake, Horse and Ram respectively. With lithography and embossing as well as silver hot foil stamping for the stamps, each animal glitters and shines, adding festive ambience to the New Year. Well done Hong Kong Post. Hello, tonight I hope you will enjoy this MS from Hong Kong to celebrate the Year of the Ram, as you can see it is termed here. 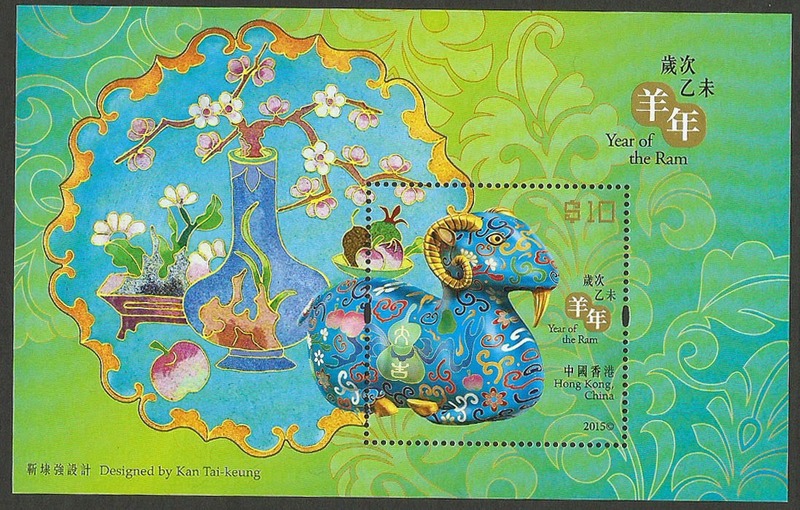 This $10 stamp sheetlet showcases a cloisonné ram. Cloisonné is a traditional Chinese handicraft. In making cloisonné ware, cloisons (fine copper wires) are soldered onto red copper objects in a pattern to be filled in with enamel and then fired, polished and gilded. Hello, well it is Friday and where did the last 12 days go? I really do not know. Hello, changing themes completely tonight because I was able to get a copy of this today at the Mong Kok stamp arcade in Kowloon. Beautiful I think. click image to enlarge then the back arrow to return. 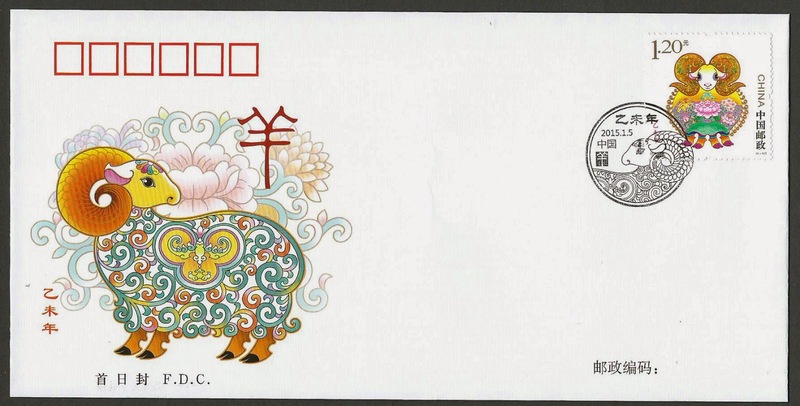 Issued by China on January 5th to commemorate the Year of the Sheep. The Sheep is regarded as an auspicious animal in Chinese culture as I understand it. 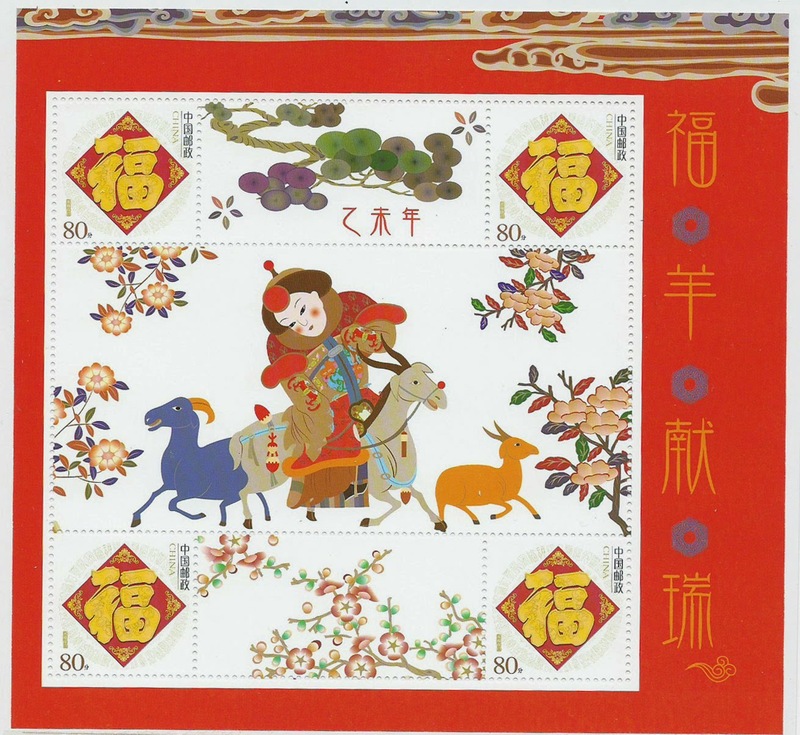 The composition of the stamp design symbolises auspiciousness and ever lasting happiness and is to convey people's good wish for the new year. How important is that for us all. Hello, I have been studying more stamps today and these were just two of them. Can you spot the difference? But, the left stamp has a larger white margin than the right stamp. Specialised GB catalogue as N 49, termed small format, for the left stamp and N50, termed intermediate format, for the right stamp. No catalogue price difference as far as I know, but if you have inverted or sideways watermarks you will find there are price differences, and in some cases quite significant. 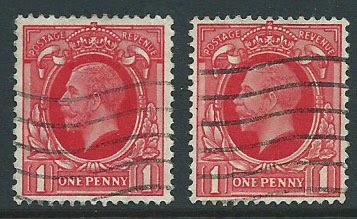 Always worth checking what look like simple low value stamps for variations. Hope you like it. 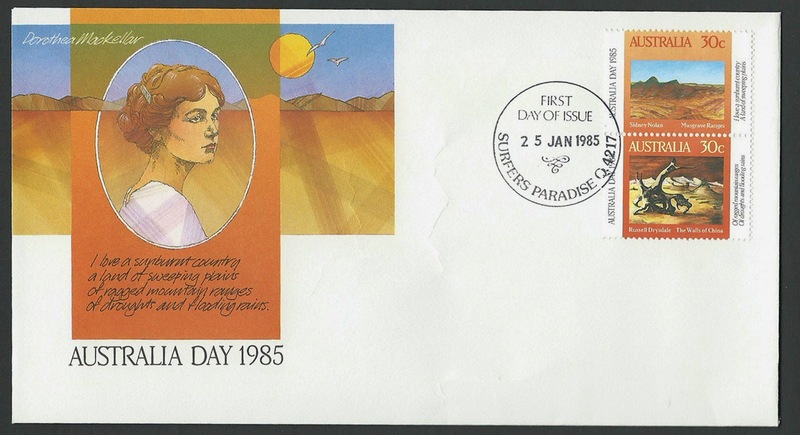 Reason I am showing it, apart from upcoming Australia Day is that I read a thread on one site about FDC (First Day Covers) basically saying that FDCs had little to no value now. Well sadly that is generally true, if one uses the stamp fairs and internet sales to judge by. The value, is to you and your enjoyment of owning and completing whatever is your collection. Not everything has to be judged solely by monetary worth, does it? Want this cover? Ok the quiz. No nothing about Australia Day, tell me what mistake I made in this write up. :-) lets see who is paying attention. Email me at cddstamps@gmail.com with your mailing address and first correct answer , the cover will be mailed to you. 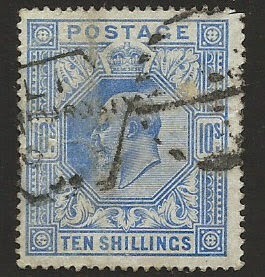 www.cddstamps.com - where you know you can fill a few gaps in your collection at small prices. A few now loaded to my Bidstart Store if you are looking to fill a few gaps in your collection. at 5% of cat or less. I was reading about GV issues and came across this interesting article. Not really to do with the stamps I am talking about but I just thought I would share it with you anyway. Fun read if nothing else. Hello, well January is off to a fast start isn't it. I even made time over the weekend to list some new GB stock to my Bidstart Store. Sadly some of the material I was sorting had light toning (mostly thrown in the bin) , and even a few with some damage. But some people are happy to collect spacefillers. After all, a really nice copy of the stamp above will set you back a few weeks pocket money, or more !!!!!!!! And don't forget the January promotion I have, for a free copy of the Hong Kong - China Danxia miniature sheet, see previous writing, which you would get if you bought this. Anyway, lots more to be listed in coming days and weeks, if only I had more time. Happy New Year everyone. Seems like ages since I wrote. Christmas and New Year always busy. I hope you all had a wonderful festive season and holiday season. Here in Hong Kong we have our "real" new year in February. More in that in future articles I expect, when I get some of the Year of the Sheep stamps to show you. This one below I hope you enjoy. I am starting the year with a special offer to my Bidstart customers because I think you will enjoy owning this beautiful Miniature Sheet . 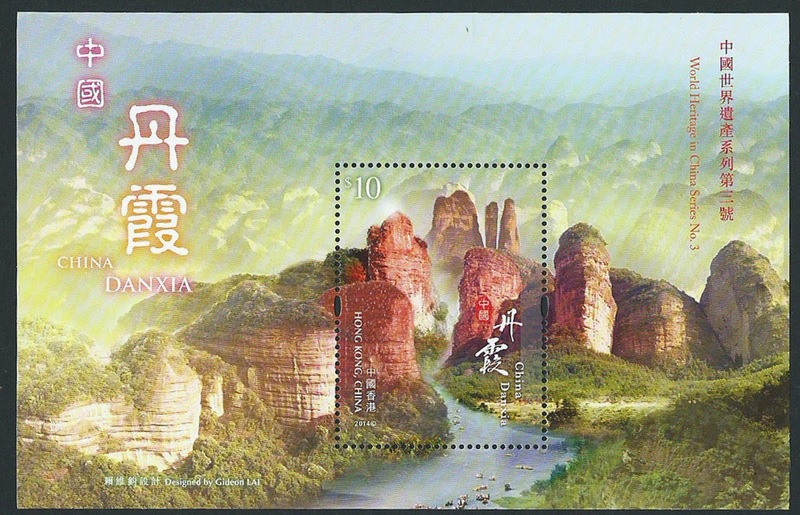 This is the third MS in a series issued by Hong Kong Post to commemorate the amazing natural heritage of China, under the theme of China Danxia. China Danxia was inscribed on the World Heritage List by the World Heritage Committee under the United Nations Educational, Scientific and Cultural Organization (UNESCO) in 2010.